The Bruss MHW-plus is an oil-based weighing system for fork lift trucks with superior accuracy combined with extreme ease of use. With this instrument you will no longer recieve incorrect values in your warehouse and your people can accuratly inform the transport company about the weight of the goods. Dangerous heavy loads are spotted directly and can be dealt with accoordingly. Safety First! The Return on investment is unique in the branche - ask your Material handling dealer for a quote. The MHW+ lowers the forks for 4 seconds and weighs the goods while in motion. 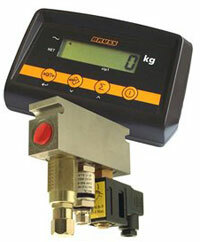 This ensure an accurate measurement of the oil pressure which are converted into kilograms. With a Bruss MHW+ any weight is the right weight. Bruss Weighing on Wheels !